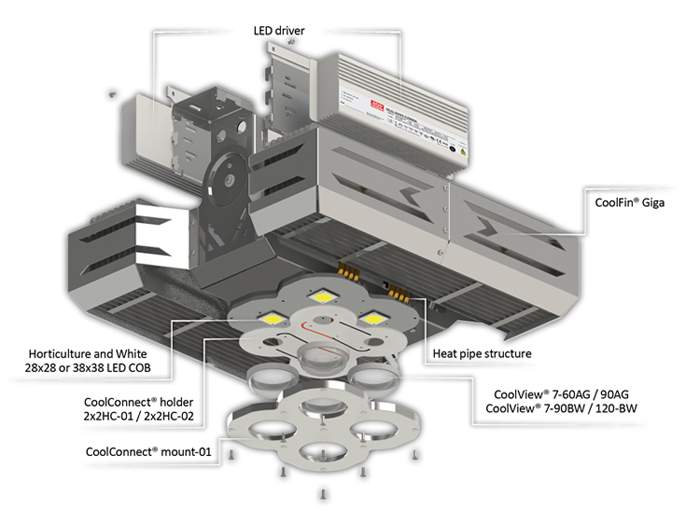 Built around the same quadruple LED engine structure as the CoolCube®, this ultra-high power cooler also demonstrates what a thermal resistance of just 0.1K/W can do - up to 100.000 lumen of white light, or 2.000μmol/s in the horticulture PAR spectrum. The design objective here was to design a cooler with an overall minimal height, resulting in a height of just 22cm. This height objective came from the idea of maximal utilization of the construction height of warehouses. A further advantage can be seen at indoor horticulture cultivation – cultivation without daylight – where you also want to benefit your maximal internal height.